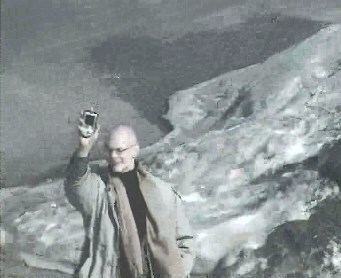 Take your photo with a Java controlled webcam at the web address http://weather.savonia.fi/misc/camera/. You will likely need the help of a friend to be able to capture your image. The camera in the given URL can be controlled over the internet using a Java enabled browser. The camera view covers a huge area around the cache, so be creative when taking your photo. Also, remember to hold your GPS device high up in the air so that the people working in the building have something to laugh at during the boring day at work. Kuopio High Tech at 11.4.2004.Liimes visiting the cache.